IN* This is an ORIGINAL MESSAGE, sent hy post to save telegrnpJ ic. save time and formalities it is worded aud signed as ij it had been. 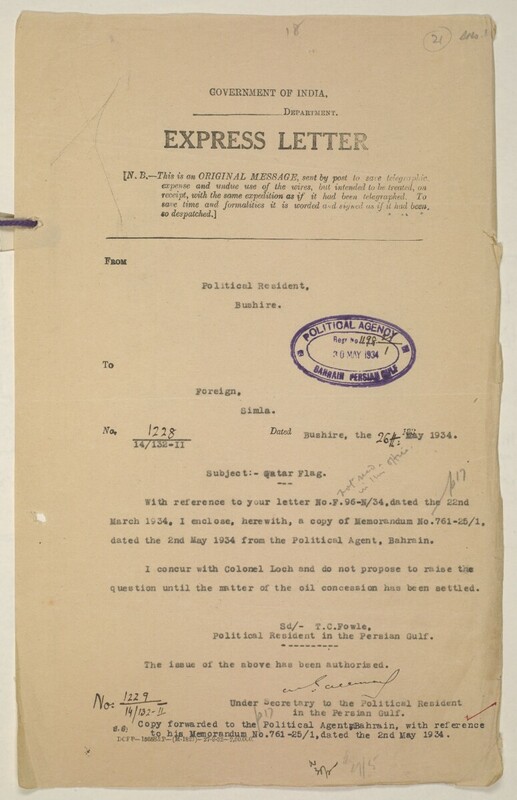 dated the 2nd May 1934 from the Political Agent A mid-ranking political representative (equivalent to a Consul) from the diplomatic corps of the Government of India or one of its subordinate provincial governments, in charge of a Political Agency. , Bahrein. question until the natter of the oil concession has been settled. Polit ical Reuident in the Persian Gulf Historically used by the British to refer to the sea area between the Arabian Peninsula and Iran. Often referred to as The Gulf or the Arabian Gulf. . The issue oi the above has been author is ed. Under Secretary to the Political Resident A senior ranking political representative (equivalent to a Consul General) from the diplomatic corps of the Government of India or one of its subordinate provincial governments, in charge of a Political Residency. >V: in the Persian Gulf Historically used by the British to refer to the sea area between the Arabian Peninsula and Iran. Often referred to as The Gulf or the Arabian Gulf. .
, DCfp-lAi I (tes-#?l?fSiSmo 1,0 - 761 - 25 / 1 ' aated ^ ZndB^y 1934.